Colonel Mustard, Mixed Media, including: various woods, fabrics, paper, sycamore bark, wire, doorknob, DOD punch card, bronze spill, dried orange, cloves, urchin shell, pull chain, feather (In which we add to life's mysteries. ), 2011, 17"w x 11.5"h x 3.5"d, $1200. Enjoy the Interval, Mixed Media, including: various metals, plastics, rubber, silver leaf, feather, dried rosebud, 2015, 27.5”w x 23.5”h x 2.25”d, $1250. It depends on which way the wind blows, Mixed Media, including: paper, pastel, white-out on foam board (Pages from a graphic novel in search of an author. ), 2015, 34”w x 20”h, $1250. String Theory, Mixed media, including cotton, silk, & poly threads, magnifying glass, calligraphy ink, sand, 2017, 18.5"w x 14.5"h x 2.5"d, $320. 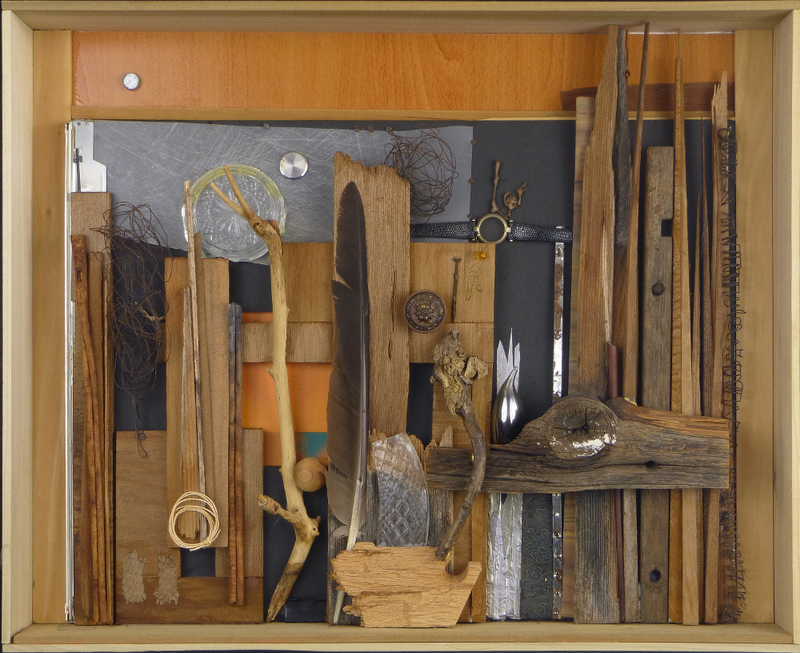 The City at 2am, Mixed Media, including: various woods, glass, metals, leather, paper, plastic, feather, fabric, bronze spill, watchband, wire, snakeskin, lightbulb, neodymium magnet, 2011, 22.75"w x 18.5"h x 3.5"d, $2100. Just One More Thing, Mixed Media, including: paper, polyester mesh, ink, charcoal, 2016, 29" h × 25"w, $640. "The Rift", 2015, Mixed Media including: paper, colored pencil, wallpaper, color photograph. 22"w x 16"h, $450. Free Association, 2014, 9.5"w x 4.25"h x 3.5"d. Mixed media, including wood, various metals, bronze spill, glass, bone, lightbulb filaments, $210. Any Road Will Get You There, 2014, 9.5"w x 9.5"h x 1.5". Mixed Media, including wood, metal, sand, paper, bones, sd card, feathers, lightbulb filaments, foil, stone, plastic, $320. Ask More, 2017, 13"w x 10"h x 2.5"d. Mixed media, including paper, pastel, wood, harddrive parts, various metals, glass, feathers, rubber, white glue, ink, vinyl mesh, neodymium magnet, $320. What the Camel Saw. 17.75"w x 23.75"h, 2013. Mixed Media, including paper, pastel, wood, rusted iron, plastic fresnel lens, $2150.. Waiting for the Solstice, 14”w x 7.75”h x 1.5”d, 2011. Mixed Media, including wood, metal, bronze spill, glass, shells, playing card, fabric, cork, feather, grape twigs, $860. And people who have said "I saw this and thought of you..."
A rusted piece of something-or-other, a feather, a bone, a dead hard drive. These are narrative works in which stories unfold.